In May 2012, CAMPER helmsman Roberto ‘Chuny’ Bermudez found himself nearly face to face with a whale in the middle of the North Atlantic Ocean. In a pretty extraordinary video from a rainy day on the Miami to Lisbon leg of the Volvo Ocean Race 2011-12, you see Bermudez swing the boat, which had been hurtling through the ocean at over 20 knots, into the wind and just narrowly avoid what would have been a catastrophic collision with a marine mammal. Another video, dated May 2016 from the Canadian Ocean Racing team, highlights what happens when a sailing vessel collides at night. “We were doing 15-20 knots and there was this loud smack,” says a crewmember into the camera. “Everyone came on deck because we weren’t sure what happened, and then afterwards we saw the whale surface.” For Canadian Ocean Racing and their IMOCA Open 60 O Canada, the incident left them without a starboard rudder. For the whale, its fate remains unknown, but it’s assumed by some scientists that a collision with a large enough vessel going over 10 knots can easily be considered a lethal encounter. Incidents like these illustrate a growing problem within the sailing community that needs to be addressed by sailors, regatta organizers, and anyone directly responsible for determining where boats will be sailing. With sailboats becoming more numerous and faster, the potential for more ship strikes is expected to increase unless we change something. In 2012, Ritter published a study finding that, over the last 60 years, 81 reported collisions and 42 near misses of whales and sailing vessels were reported, and a greater proportion of these were from more recent years. Damian Foxall, veteran ocean racer and Recreation Education Manager at the Canadian Wildlife Federation, is confident that this number is only the tip of the iceberg. One race Foxall brings up as a perfect example is the 2016 IMOCA Ocean Masters Transat from New York, NY to Les Sables d’Olonne, France. Fourteen singlehanded IMOCA 60 monohulls departed New York, bound for Les Sables-d’Olonne on May 29th. After leaving New York, all sailors took care to avoid a Right Whale Exclusion Zone and a Traffic Separation Scheme (TSS) off of Nantucket designed to create distance between ships and a sensitive habitat area. Both Foxall and Ritter urge race organizers to apply care towards the timing and route planning of offshore events and to inform sailors of where they are most likely to encounter whales, dolphins, and other vulnerable marine life. They also encourage organizers provide general advice on the species most likely to be encountered along an intended route. Whales, for instance, tend to aggregate so if sailors report one whale, there’s a very good probability that there are others in the area. If an accident between a sailing vessel and a whale takes place, both Foxall and Ritter urge sailors to take the time to report the incident, not only as a notice to mariners in the area, but also to the International Whaling Commission’s global database on ship strikes located at iwc.int/ship-strikes. *We would like to extend a special thank you to the sailors and race organizers who contributed to this story or have shared their stories of whale strikes publicly. 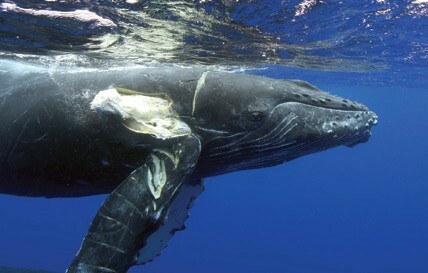 Marine mammal strikes are scary and dangerous, and not many are reported. The more we report and provide data, the more we help scientists with whale research – and it is a respectful way to deal with a collision with one of these magnificent animals. This Sailors for the Sea Ocean Watch Essay is reprinted with permission. For more information, visit sailorsforthesea.org. This is the most amazing Beneteau 44.7 available. No expense has been spared on race preparation and cruising comfort. Extensive race/cruise equipment list, full details/specifications must be viewed to appreciate. Heated indoor winter storage for 12 years. You will not find a better 44.7 on the market. SPRING PRICE REDUCTION! This Hunter 466 offers great versatility; plenty of space for long passages or living aboard coupled with easy to handle sail plan. The B&R rig with roller furling main, non over lapping jib and all lines led aft make taking this 46 footer out for a quick day sail a joy! The 3-cabin, 3-head layout is open and airy with plenty of light and ventilation. This 466 has been very nicely maintained and upgraded by the same owner for the last 15 yrs. Here is an Island Packet long distance cruiser priced right and ready to sail offshore or in your neighborhood. Raymarine Hybrid Touch GPS 2014; Solar Panels on Bimini; Wind Generator; In mast roller furling main 2012; BOW THRUSTER; New Stainless Steel holding tank; read on for more! Call and make an offer.